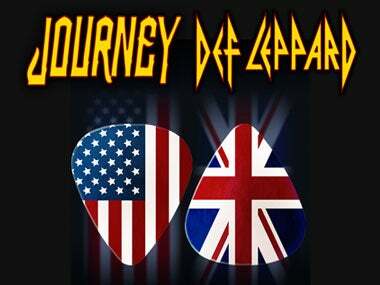 SACRAMENTO, CA – Promising to be the Tour of the Year, two of the world’s greatest rock bands – Def Leppard and Journey – are teaming up for a massive co-headlining North American tour composed of both stadium and arena concerts, half the shows being closed by Journey and half by Def Leppard. The tour, promoted by Live Nation, kicks off May 21 in Hartford, Connecticut, at the XL Center and will feature complete sets and all-new production from both bands, and an arsenal of their hits such as “Pour Some Sugar on Me,” “Lights,” “Photograph,” “Don’t Stop Believin’,” “Rock of Ages” and “Faithfully.” Tickets go on sale beginning Saturday, February 3, at LiveNation.com. Stay tuned for presale and VIP ticketing information. The 58-city tour will hit ten stadiums - Toronto’s Rogers Centre; Atlanta’s Sun Trust Park; Detroit’s Comerica Park; Chicago’s Wrigley Field; Denver’s Coors Field; Minneapolis’ Target Field; Boston’s Fenway Park; St. Louis’ Busch Stadium; San Francisco’s AT&T Park; and San Diego’s Petco Park - as well as world-famous arenas and Sacramento’s Golden 1 Center on Thursday, October 4. With more than 100 million albums sold worldwide and two prestigious Diamond Awards in the U.S., Def Leppard - Joe Elliott (vocals), Phil Collen (guitar), Rick "Sav" Savage (bass), Vivian Campbell (guitar) and Rick Allen (drums) — continue to be one of the most important forces in rock music. Over the course of their career the band has produced a series of classic ground-breaking albums that set the bar for generations of music fans and artists alike. The group’s spectacular live shows and arsenal of hits have become synonymous with their name, leading Def Leppard to be heralded as an institution in both the music and touring industry. Def Leppard’s influential career includes numerous hit singles and ground-breaking multi-platinum albums—including two of the best-selling albums of all time, Pyromania and Hysteria, capturing the group’s legendary tracks, bringing together classic Leppard hits such as “Rock of Ages”, Pour Some Sugar on Me” and “Foolin.” The band’s most recent self-titled studio album debuted at #1 on Billboard’s Top Rock Albumsand Top Independent Albums charts. The album also took the #5 spot onBillboard’s Top Current Albums and #10 spot on the Top 200, as well as claiming 15 top 10 debuts around the world. For the first time, in January 2018 Def Leppard debuted their full recording catalog worldwide via streaming and download platforms, listen HERE.